President Donald Trump tweeted Friday that his administration was giving "strong considerations" to release detained illegal immigrants into sanctuary cities, saying such a maneuver would make liberals who support open borders "very happy." His announcement followed a Thursday Washington Post report that the White House had considered such a proposal, which included statements given to the Post by the White House and Department of Homeland Security that such an idea had been considered and quickly rejected. 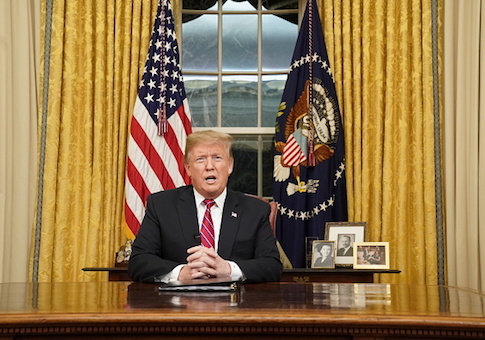 "Due to the fact that Democrats are unwilling to change our very dangerous immigration laws, we are indeed, as reported, giving strong considerations to placing Illegal Immigrants in Sanctuary Cities only," Trump wrote. "The Radical Left always seems to have an Open Borders, Open Arms policy – so this should make them very happy!" The Post reported Trump's White House had suggested moving detained illegal immigrants to the small- and mid-sized cities at least twice in the past six months, with Speaker Nancy Pelosi's (D., Calif.) San Francisco congressional district among the possible locations. According to the report, acting Immigrations and Custom Enforcement (ICE) Director Matthew Albence opposed the idea when deputy director in November after senior Trump adviser Stephen Miller spoke to ICE about it. Trump has been a strong critic of so-called "catch-and-release" laws; under the current system, detainees can go where they please after being processed and released but have to tell the government their address. With migrants crossing the border in increasing numbers, the U.S. asylum system is at risk of being overwhelmed. "We have horrible, old-fashioned laws that are put in by the Democrats," Trump said Friday at the White House. "We're willing to change them. We could do it in 15 minutes, whether it's catch-and-release or chain migration or any of them. The asylum laws are absolutely insane." Rep. Bennie Thompson (D., Miss. ), the chairman of the House Homeland Security Committee, ripped Trump over his plan on Friday, according to The Hill. "The fact that this idea was even considered—not once but twice—serves as a reminder that the Trump Administration’s reckless immigration agenda is not about keeping the country safe, but about partisan politics and wantonly inflicting cruelty," he said in a statement. Pelosi said such an idea was "disrespectful" and "unworthy of the presidency." This entry was posted in Issues and tagged Donald Trump, ICE, Illegal Immigration, Nancy Pelosi, Trump Administration. Bookmark the permalink.